I love the concept of bikepacking, the idea of using different types of bags, like a frame bag, a seat bag, a handlebar bag and so on. And believe or not, they are versatile and not only for bikepacking adventures. They work for commuting and grocery shopping too. Over a year ago when I planned my fatbike project, my clear choice for the front fork was the Salsa Enabler, because it has three back-of-fork-leg water bottle mounts for Salsa Anything Cages. They hold lightweight, roundish objects such as insulated Nalgene bottle holders, small drybags, sleeping pads and shelters. With smaller drybags one can pack small things and carry them conventionally with the Anything Cage. Many of the lightweight drybags are not very sturdy, and you have to use the Anything Cage straps to attach them to the cage. Something better would be nice. Revelate Designs has been the most known bikepacking bag maker so far, but there are others. One of them is Porcelain Rocket, runned by a brilliant man called Scott Felter. Now, Revelate doesn't do custom bags anymore, but Porcelain does. Look at the Flickr page of Porcelain Rocket - Scott's work is truly magnificent! Now Scott makes absolutely sweet bags for Anything Cage. I ordered a pair of them, in custom red/black color to match my 9:Zero:7. Hover your mouse over the photos for more info! The bag weights in at 117g, so it's lightweight. The construction is sturdy, and it sits perfectly in the Anything Cage. It's really fast and easy to attach to the cage, thanks to the double-back attachment wings. The maximum capacity for the bag is 4L. All of the stuff in the photo below packed nicely in there! So, if you need a perfect bag for your Anything Cage, or any other bag too, look for Porcelain Rocket. Thanks again Scott for my bags, keep up the great work! From spring back to winter? The last two weeks have been warm here in Southern Finland, the daytime temperatures were about +10°C many times. The spring has progressed quickly, but like almost always here, spring never comes easily. Usually there is some cooler period, or even number of periods, before the spring is in full swing. As writing this, the temperature has dropped to 0°C and there is a thin cover of snow outside. The weather forecasts are looking for cold nights (temperature can drop to even -10°C at some point) and even more snow. Here is a photo recap of my March 22nd thru 30th, with a feeling of spring. The spring equinox was yesterday, and yes, it has felt like spring lately. On Sunday evening I listened to some birds at my home yard that can't be heard in winter. The daytime temperature has been above zero over a week. The snow is melting. On Friday I really needed to get outside, and did a short walk in Kimito Island. The album links: Google+ and Picasa (with some extra photos). And finally some news. My first writing at Fat-bike.com was published on Monday. In the three-part series I take a look of fatbiking in Finland. 'Erätulilla' TV series started on YLE TV2 on Friday March 16th. 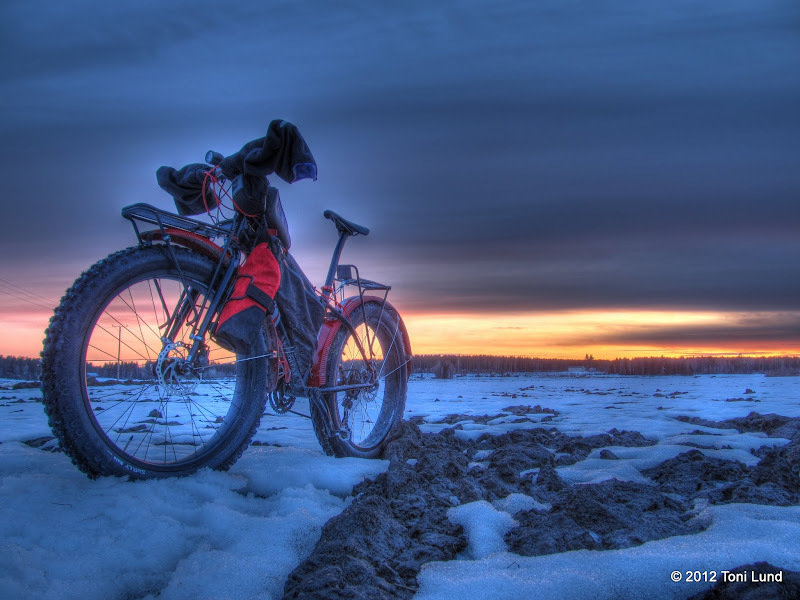 The fatbiking story is featured in the next part that will be aired on Friday March 23. There is already a short trailer at YLE Areena, check it out! Unfortunately YLE Areena works only in Finland, but those who knows how to play with free proxies can see it. And the video at their program page should actually work overseas.